I find a real need for limits on writing. Limits, lids, timers, alarms are planks dropped across the potentially bottomless amount of time I would otherwise like to spend on my writing. The paradox is that on the rare occasions during a year in which I actually have an entire day for writing, I slow down, way down. Then I spend much more time contemplating the act of writing, sipping my coffee, staring at the trees, getting ready. Nothing wrong with that--it's very relaxing & reflective--but it usually results in the same amount of completed writing as a much shorter session. 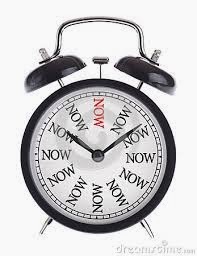 In terms of mindfulness practice, these limits increase my flexibility to deal with changes that arise in the moment (including domestic interruptions like a child who suddenly appears out of nowhere at my elbow in the early hours of the morning). This is something I touched upon in my guest post for Mother Writer Mentor: http://www.motherwritermentor.com/2012/05/07/water-breaks-writers-block/. The other affordance of time limits is how they place black marks around each present moment, defining what otherwise might stay invisible. I am more aware of each moment because it is finite, because of these black margins on my time. It's a sensation not unlike the little buzz I feel right before a piece (especially a poem) is about to be finished. I might be carrying around a draft for months (or even years) and then this subterranean alarm starts buzzing, rising rapidly to the surface. Knowing I have only 30 or 45 minutes to write gives the same sensation but with less tension. It suggests that an end to my engagement with intrapersonal voice is imminent and that I'd better get going. So all writing is like a minor mid-life crisis in that regard. Of course, such limits can be simulated. One doesn't need a child with a request for glass of water or a stack of reports from work. You can force yourself to write in 20-minute bursts or for only 30 minutes a day. You can also turn to writing as a form of meditation. Every present moment comes packed with its own timer.